AV2 media enhanced books are based on national curriculum standards. Content found online at www.av2books.com helps make the books come alive with audio and visuals features. There are many potential approaches for teachers who choose to take advantage of AV2’s learning materials. What is the rationale for AV2? www.av2books.com has been developed to accompany Weigl books. The site includes audio, videos, web links, quizzes, key words, slide shows, interactive activities, core activities, plus activities for differentiated learning, through which students explore the covered subject. These features can be used for group work, research, and interdisciplinary projects that will help students meet important knowledge and skill outcomes in U.S. curricula from grades K to 12. What educational standards does AV2 meet? AV2 media enhanced books will help students meet key National Education Standards for grades K to 12, as set out by the National Science Teachers Association (NSTA), The National Council of Teachers of English (NCTE), in addition to curriculum standards defined by the National Council for the Social Studies (NCSS). Click here to find relevant knowledge and skill standards for each series and title. Teacher can use a single book to prepare a class presentation, making use of the provided class activities and videos to supplement the book’s content. Teachers can then print off provided quizzes and individual activities for students to complete on their own or in a group. Teachers can purchase a classroom set, which contains a book and an AV2 access code for each student.With this option, students can access the full AV2 site at home, AV2 makes an excellent review/study suite. Teachers can distribute a different book from the same series to each student. AV2 titles belonging to the same series share a set of features, which allows a group of students to complete matching activities and then consolidate their findings. All AV2 activities note the page spread where the answers to the activity can be found. This provides teachers with the flexibility to use the activities however they see fit. Students can perform a self-assessment, at home or in class, or teachers can grade the assignments and use it as course work. In addition, at the end of each book a glossary of terms is provided so that students can better comprehend the content. How can AV2 be used for skills development? All supplementary materials focus on higher level thinking skills as outlined by Bloom’s Taxonomy. The AV2 activities provide opportunities for students to analyze, synthesize, and evaluate information and concepts covered in the corresponding book. Using AV2, teachers can prepare lessons that emphasize collaborative learning, the development of effective research skills, synthesizing information, and engaging students in evaluating information and assessing their work. Activities are based on best practices as outlined by the NSTA, NCTE, and NCSS. How does AV2 incorporate differentiated learning strategies? All activities encourage verbal, written, and artistic expression by students. Hands-on activities involve kinesthetic learning or creative thinking, and can be used to support struggling learners. What are AV2 comprehension strategies? AV2’s activities can be used for guided reading—instruction for small student-groups reading the same texts. Guided reading encourages students with similar reading levels to use problem-solving skills to construct meaning from text. Specific comprehension strategies are integrated into activities. These comprehension strategies fall into five categories. Students make predictions after viewing photographs, graphs, and other images. Students suggest questions they have about a topic. Students infer, based on obvious clues provided in written text or images. Students use imaging to picture what a written word looks like or what it means. Have students use the following questions to help them evaluate which resources to choose. Will this resource answer my questions? Can I read and understand this information? Who wrote the information? Can I believe it? What makes this person an expert? What are AV2 assessment strategies? Each AV2 title includes a quiz that can be downloaded and completed by sites users. The quiz can be used for self-assessment after reading the book. In addition, all AV2 activities note the page spread where the answers to the activity can be found. This provides teachers with the flexibility to use the activities however they see fit. Students can perform a self-assessment, at home or in class, or teachers can grade the assignments and use it as course work. How is Safe Content Selected for AV2? AV2 is committed to providing a safe learning environment for children to explore. Every reasonable effort is taken to ensure high-quality content standards are upheld. As an online learning environment, AV2 produces new content and organizes already-available content that is found to be ideal for teaching a given topic. This mixture of produced and collected content ensures a higher standard of quality. AV2 uses integrated resources that reflect the latest curriculum standards. The content provided fits the best pedagogical strategies used by teachers in today’s classrooms. With a focus on creating inspired learning, AV2 resources engage young students through eye-catching visuals and well-researched, trustworthy content. AV2 content covers multiple learning styles with a variety of activities, including videos, quizzes, writing assignments, and charts. Children of varying learning styles and abilities will benefit from AV2’s content. What Sensitivity Guidelines does AV2 Follow? portray decisions made by males and females relative to career choices, roles, etc. In ways which reflect a range of options available in contemporary society. represent racial, ethnic and national groups within literature, art, history, etc. In ways which reflect accurately the norms and context of the time period being studied. Reflect the positive, creative contribution of racial and ethnic minority groups to cultural life (i.e. economics, arts, politics, community life). present the views of those who profess no religious belief in sensitive and respectful ways. assist students to recognize the basic similarities and worth among all people and the uniqueness of every individual, including those with “differences”. accurately reflect the society being studied at a given point in time. How Does AV2 Monitor Website and Video Content? All links are put through a rigorous evaluation process to ensure their content is age-appropriate, credible, and engaging. However, we cannot guarantee the content of web links or external videos. Due to the dynamic nature of the Internet, some of the URLs provided as part of AV2 by Weigl may have changed or ceased to exist. AV2 by Weigl accepts no responsibility for any such changes. This is because AV2 by Weigl does not produce the links/videos or maintain and update them have ability to change the content on these links/videos receive notification when these links/videos are changed In addition, some of links/videos may offer products or services for purchase. AV2 does not necessarily endorse the products or services available for purchase through these links. All media enhanced books are regularly monitored to update addresses and sites in a timely manner. In addition, AV2 by Weigl does not monitor entire sites. Users may navigate away from the specific link provided. Content in other areas of a site may not be suitable for the user. 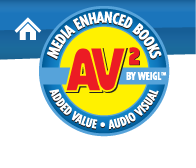 As a standard, links and videos included on www.av2books.com is suitable for children. We aim to ensure that he link/video accessed through AV2 does not lead directly to information that is unsuitable for children. Contact AV2 by Weigl at 1-866-649-3445 or av2books@weigl.com with any questions, comments, or feedback.